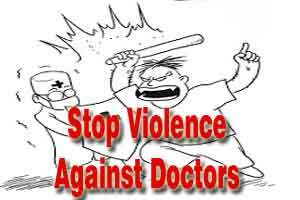 New Delhi: A 27-year-old doctor of the Pt Madan Mohan Malviya Hospital was allegedly beaten up by attendants of a patient in the early hours of today at the hospital, the police said. Two men have been arrested in the case. Four to five men came to the emergency ward where Dr Wasim Masuri was on duty on the intervening night of October 24 and 25. One of them, who identified himself as Tahir Khan, a resident of Hauz Rani, had injured his hand, the police said. Khan asked the doctor to treat him quickly while the people accompanying him started throwing medicines and even got into a scuffle with two ward boys, the doctor alleged in his complaint. The police said that when Masuri protested, they thrashed him. The doctor managed to alert the chief medical officer of the hospital, who informed the police. However, the accused fled from the spot, they said. Police later arrested two of the accused, who are in their 20s.